Of late, the Western Europe market for teleradiology has been experiencing a substantial surge, thanks to the constant evolution of information and communication technologies in this region. Going forward, the shortage of expert radiologists across Europe is likely to fuel the demand for teleradiology solutions in the near future, reflecting greatly on this market. 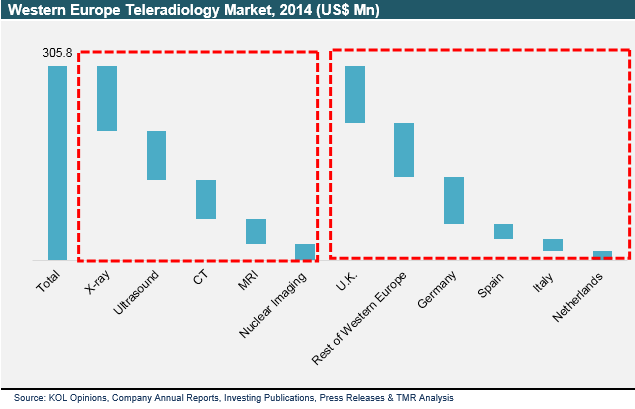 In 2014, the opportunity in the Western Europe teleradiology market was US$305.8 mn. Expanding at a CAGR of 18.50% during the period from 2015 to 2023, it is likely to reach US$1443.7 mn by 2023 end. The cost efficiency of teleradiology solutions, emergency coverage, and the rising number of imaging procedures are projected to boost this market over the next few years. However, the complex regulations, high initial investment, and language barrier are expected to limit the growth of this regional market in the years to come. Majorly, the Western Europe teleradiology market is analyzed on the basis of the modality into magnetic resonance imaging (MRI), X-ray, computed tomography, ultrasound, and nuclear imaging. Among these, the demand for X-ray has been relatively higher and this trend is anticipated to remain so over the forthcoming years, thanks to rising number of X-ray procedures and the need for expert radiologist advice due to complexity of images. Among others, ultrasound teleradiology has been reporting a high adoption rate, thanks to the advent of 3D and 4D ultrasound platforms, improved image quality, and the absence of ionizing radiation. CT teleradiology, on the other hand, is expected to surface as a highly lucrative segment over the forecast period, owing to favorable reimbursement policies and its ability to easily visualize complex body parts, such as lungs, brain, and cardiac abnormalities. The Western Europe market for teleradiology is spread across the U.K., the Netherlands, Spain, Germany, Italy, and the Rest of Western Europe. The U.K. and Germany together accounted for the largest share of the market. In 2014, the U.K. led the teleradiology market in Western Europe and this scenario is anticipated to remain so in the years to come. The advancements in digital image processing technology, increasing implementation of picture archiving communication systems (PACS), and the presence of a large pool of well-established market players, together with a number of domestic service providers, are the key factors behind the growth of the U.K. market for teleradiology. Germany stood second in 2014 and is projected to retain its position over the forthcoming years. The dearth of expert radiologists and the rising number of government initiatives are likely to support the teleradiology market in this country. Agfa-Gevaert N.V., ONRAD Inc., Telemedicine Clinic, Cybernet Medical Corp., Sectra AB, and Global Diagnostics Ltd. are some of the key vendors of teleradiology solutions in the Western Europe. The market demonstrates a fragmented and highly competitive business landscape. The leading companies are expected to involve into strategic partnerships and mergers and acquisitions over the next few years. Teleradiology has now become an inseparable part of telehealth services across in Western Europe. The technology that allows the electronic transfer of radiology images between two locations to enable emergency services or allow for a second opinion, is increasingly being seen as the bridge between the mounting demand and lack of resources in the field of radiology and diagnostics. The market previously suffered from issues such as slow transfer of images with unreliable image quality and clarity. Over the years, however, the vast improvements observed in the field of image processing and telecommunications have made the teleradiology sector highly dependent. The report presents a thorough analytical analysis of the Western Europe teleradiology market on both regional as well as global fronts. The study presents vast historical data and plausible forecast statistics over the period between 2015 and 2023 in terms of revenue and sales figures. A detailed and all-including segmentation and the key factors expected to encourage or discourage growth of the Western Europe teleradiology market have been included in the report. The vast data in the report is expected to provide the reader a strong understanding of the key aspects of the market. Furthermore, a thorough view of the market has been provided with the help of an in-depth competitiveness analysis of the market. Analysts suggest that the increased reliability of diagnostics and other healthcare services possible with the help of the modern-day teleradiology will help the global teleradiology market attain great heights in the next few years. In Western Europe, especially, the presence of a highly developed healthcare infrastructure and an affluent patient population will help the market gain traction in the next few years. Western Europe accounts for nearly 70% to 75% of the overall Europe teleradiology market. The market is also expected to benefit from the shortage of expert radiologists in the region and the cost effectiveness of teleradiology solutions. A vast rise in the number of imaging procedures will also boost the market in the region. However, factors such as the high initial investment required to setup teleradiology practice, complex approval regulations, and language barriers are expected to hinder the overall growth prospects of the market to a certain extent. The Western Europe teleradiology market has been segmented on the basis of modality in the report into ultrasound, X-ray, magnetic resonance imaging (MRI), computed tomography, and nuclear imaging. Of these, these the segment of X-ray teleradiology dominated the overall market in 2014. The segment is also likely to retain dominance over the report’s forecast period. The high rate of adoption of X-ray procedures for a number of diagnostic purposes will be the key factor strengthening the growth prospects of the X-ray segment. The segment of ultrasound teleradiology held the second position in the Western Europe teleradiology market in 2014, chiefly owing to the development of the 3-D and 4-D ultrasound technologies, the increased reliability of ultrasound in terms of image clarity, and the absence of ionizing radiation. The CT teleradiology segment is expected to hold immense promise in the next few years. In terms of geography, the Western Europe teleradiology market has been segmented in the report into six regions: the U.K., Spain, the Netherlands, Germany, Italy, and Rest of Western Europe. Of these, the U.K. market dominates presently and is likely to lead to the most promising growth opportunities over the forecast period as well. This study on the Western Europe teleradiology market presents a vast analytical overview of the competitive landscape of the market, including insights into the leading vendors in the market, their business profiles, financial overviews, SWOT analysis, and information regarding recent developments related to the said companies. Some of the leading companies in the Western Europe teleradiology market are ONRAD, Inc., Agfa-Gevaert N.V., Global Diagnostics Ltd., Cybernet Medical Corporation, Telemedicine Clinic, and Sectra AB.